There are many pieces that go into creating a consistent brand impression. The rise of social platforms like Facebook, LinkedIn, Twitter, Pinterest, and Instagram require eye-catching images. You want and need your agency to get noticed in a noisy world. I have written previously about how to use an online service like Canva to create compelling images easily. However, often you just don’t have the time to spend on creating a great graphic, much less the expertise. There are other available options. Some websites provide you with easy, quick, and inexpensive access to people who do have the time and the expertise to create the marketing material you need to stand out. Fiverr.com is one option I have personally used. 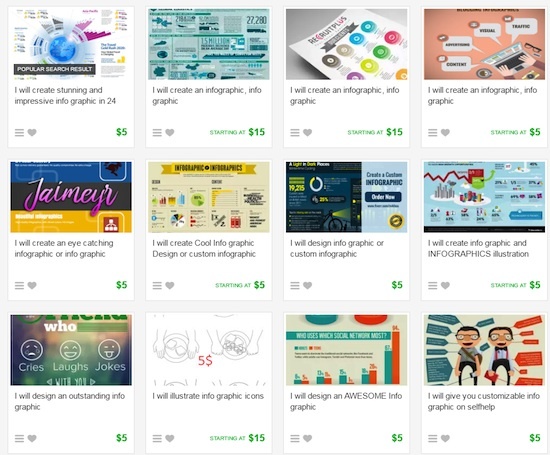 Fiverr is a website where people do things for $5. You know, a “fiver.” There are thousands of people you can hire to create just about anything you need. Be aware – there are some weird things on the site that people will do for $5. However, don’t pay attention to those, unless you have some time to kill. A word of warning. Be careful whom you work with and what they provide to you. For example, I would not provide anyone from Fiverr access to any online accounts (your website for example). And if someone is creating an image that looks too good to be true, it might have been “borrowed” from someone’s copyrighted material. Make sure you do some research. Logo creation: Design professionals will kind of cringe a little bit at this suggestion. Getting a logo done for $5 is not a good idea if you are trying to grow a professional and distinctive business. But, if you just need a logo for a new product/service/process, then getting logos done on the cheap could be a good move. Again, be aware of any copyright issues. Make sure to look at the comments and reviews for the designer you might hire. Video introductions: I have used Fiverr to create a nice looking video intro and outro. Many providers can add your agency name and information to their canned videos. It is quick and easy – and inexpensive. You can choose from a wide variety of stock templates and for a bit more money you will find something very nice. Whiteboard drawing videos: Whiteboard videos have become very popular and are quite fun. They can be great at explaining complicated insurance topics. They are simply someone writing text or drawing a little figure on a white background. Personally, I think this is an excellent way to communicate tricky insurance concepts that you can add to your website. Infographics: While I might be a bit tired of infographics, they do seem to work at getting attention. Using Fiverr could be a great way to experiment with this type of image. They are not all just $5: I have never paid just $5 for a “gig.” Some of the higher quality items on Fiverr will charge you more by saying an item is worth multiple gigs. Watch the ETA: When you order a gig, you’ll see that they have estimated times of delivery. Make sure you check that before you buy to make sure it fits your schedule. Often, quicker delivery will cost more. Contact them first: There is a contact button under the gig description for every item. Always communicate with the seller before you pay the money to make sure they are a good fit for your project. Leave feedback and answer messages: Fiverr seems to reward responsiveness. If you plan on using it regularly, make sure you reply to messages and leave feedback as quickly as possible. Puts you in good standing. Be careful: Use the platform for all communication and for delivering the money. There is a reason sites like Fiverr ask you to do everything in a transparent and on-site way. Have you used Fiverr or a similar service? What has been your experience? Let me know in the Comments section below. I have used it in the past and agree that you will spend more the $5 for most any “gigs” (jobs that you are contracting for). Upwork.com is another good site for outsourcing other tasks that are on a ongoing basis. Mike, glad you liked the post. I also use Upwork quite a bit. Will probably write about this platform in the near future.